Fromseier Hockings is one of only a few Danish fiddle/guitar duos who travel with original roots- and folk music. The duo consists of two of the most well known danish roots- and folk musicians, Ditte Fromseier on the fiddle and singing as well, and Sigurd Hockings on the guitar. This constellation is quite new, but both musicians are well known for their work with other traveling bands, such as Habbadám, Himmerland, Fiolministeriet, THG and Basco. 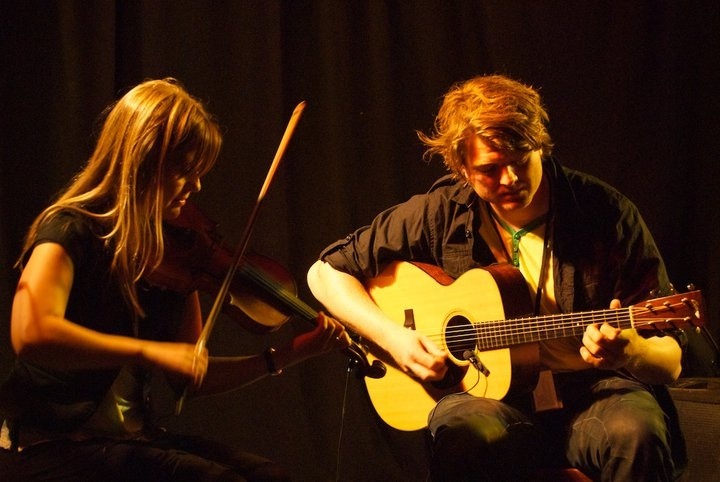 Ditte Fromseier and Sigurd Hockings met in the Copenhagen folk-session scene in the beginning of this century while they were still both students. They were imediately attracted by each others powerful musical nerve and energy. Soon after they started their first band and have since then played together in numerous constellations. In 2010 they were invited to play at the North Atlantic Fiddle Convention in Scotland as a duo and Fromseier Hockings was a reality. They realised that the duo format was an outstanding way to challenge themselves and to create new original music. Since then they have toured worldwide and have delevoped an extremely rare natural intimacy in their music. Fromseier Hockings explore every aspect of the duo format and with their performances they invite the audience into their musical world with great sensitivity and warmth. Fromseier Hockings have received numerous awards. Among them a Danish Music Award 2015 and the prestiguous ” Live Act of the Year 2015” from the Musicians Union.